I have been waiting for this 7" ever since I first got word that it was in the works many moons ago. 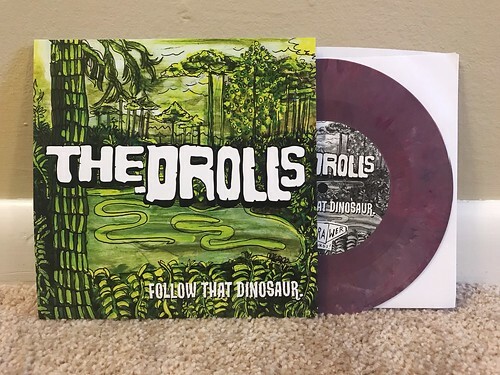 Having previously heard The Drolls' contribution to the 14 Soda Punx compilation and being lucky enough to have seen their performance at the Seattle Pop Punk Festival back in January, it seemed pretty safe to assume this debut 7" would be top notch. I assure you, top notch it is. It's impossible to write about this without mentioning that Denny (and now Josh on drums, though not on this recording) was in Sicko. Sicko are one of my all time favorite bands and when I listen to this 7", it's hard to not draw comparisons to Denny's past work. I can say that if you liked Denny's tunes in Sicko, it's inconceivable to me that you wouldn't like these two Drolls offerings. At the same time, they don't sound exactly like Sicko as there's something unique about what The Drolls are bringing to the table. "Follow That Dinosaur" starts out with a bouncy, driving rhythm in the verse that eases into one of those trademark Denny choruses. Equal parts punchy and catchy, this sounds exactly the direction I would have hoped Denny would have gone on a fifth Sicko album. "Alternate Timeline" starts off immediately making me think of one of my favorite Sicko songs, "Little" off of Chef Boy R U Dum. It's got a similar quiet/loud/quiet dynamic and man does that make the hook feel even more powerful when it kicks in. But again, though there are elements of Denny's prior work, these songs go off in their own direction and stand on their own. These songs are perfect. I love this record so much. If I have one complaint it's that there are only two songs instead of twenty. I hope this is the first of many, many Drolls releases in the future. Especially hopeful of a full length real soon.